So I've been wanting a bass to record with and to just mess around with. I have a project bass in pieces but you know how projects are. i wanted something inexpensive but solid and workable. 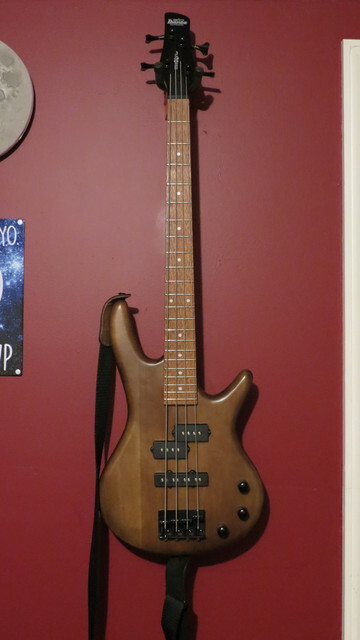 and since my project bass was a cheap ibanez gio that played really well and sounded good, before i tore it apart. 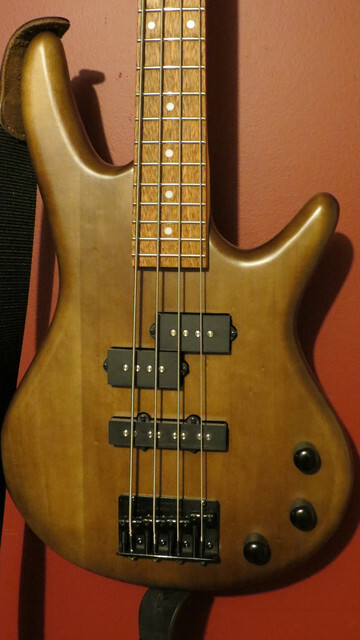 i figured i buy another ibanez bass. just by chance i came across a youtube review of the ibanez mikro short scale bass and was curious. friday i ordered it for 179. got it saturday and played it for about 5 hours straight sunday after setting it up good. for the price it's perfect, particularly for guitarists who want an inexpensive bass to noodle with. and being a short scale bass it's an easy transition. in fact it's just a tad longer than my strat. it's very light weight and sounds good for the price. the fretboard was done really well too. the fret ends were very smooth. i was a little surprised at how good the fretwork was for the price, by far the best part of the guitar. other than that there were a few small blemishes in the finish but nothing serious or that concerned me. and overall the finish it self 'felt' like a $179 guitar finish. and a few things look cheap on it, like the black plastic of the pickups. it sounds good though, has a good tonal range, and it holds tune well. being a short scale it doesn't have that low end presence of a regular scale bass but it still has some thunder. i am fairly happy with it. they have a 5 string version that i may get soon as well. i want to get a crush 25 or 50 bass combo for it now. i wonder how the cabsim on the headphone out sounds on those? here it is though it is not much to look at. What's the fret board material? Looks pretty funky!!! I like those wooden bodied basses, they look really nice!!! i was thinking when these get dull either flats or half rounds next. and the fret board is jatoba. i had never heard of it before this. i've been playing a rocksmith with it a lot between today and yesterday. the flats have a deep tone but are pretty lifeless, great for jazz..the ground rounds have some bite.. but a much deeper woodier tone than the standard strings. enjot the bass..you got a great example! I've heard of that wood before, but can't recall seeing it. Looks very nice!! !